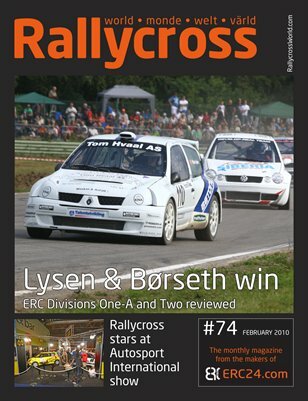 This month we complete the review of the 2009 European Rallycross Championship by taking a close look at Divisions One-A and Two. Rallycross World has also been at the awards ceremonies that start the year, we have pictures from the FIA and British championship awards this month. We also have coverage from Autosport International, news of a new track in the UK and we reveal why a Rallycross driver is tipped to become president… All this and the essential Rallycross World diary rounding up the news for January.